The arrangement for containment of cargo including, where fitted, a primary and secondary barrier, associated insulation and any intervening spaces, and adjacent structure, if necessary for the support of these elements. If the secondary barrier is part of the hull structure it may be a boundary of the hold space. 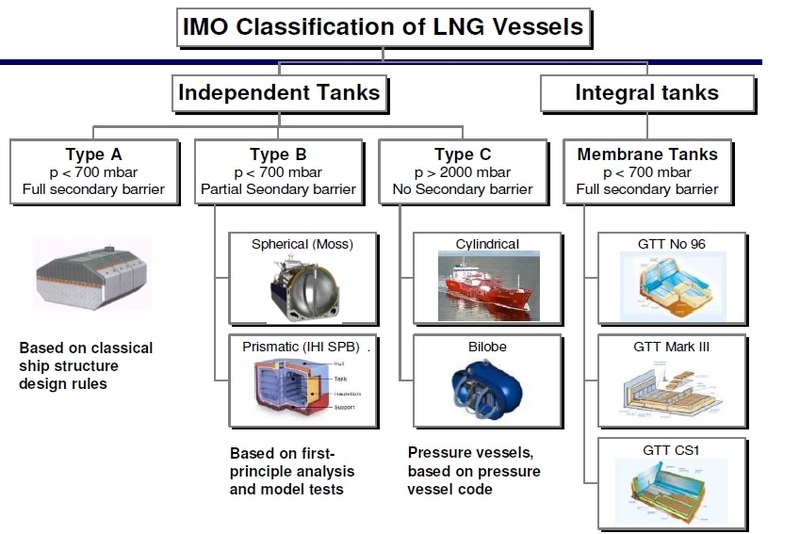 To contain LNG cargo at cryogenic temperatures (-160 degree C). To insulate the cargo from the hull structure. The materials used for the hull structure are designed to withstand varying degrees of temperature. At temperatures below their specified limits, these steels will crystallise and become brittle. The materials used for the containment system are required to reduce the heat transfer from the hull structure to minimise boil-off gas from the cargo, as well as to protect the hull structure from the effects of cryogenic temperatures. The cargo containment system consists of insulated cargo tanks encased within the inner hull and situated in-line from forward to aft. The spaces between the inner hull and outer hull are used for ballast and will also protect the cargo tanks in the event of an emergency situation, such as collision or grounding. The cargo tanks are separated from other compartments, and from each other, by transverse cofferdams which are dry compartments. The following description is of a Gaz Transport GT96 double membrane system design. Although the principal design features will be similar in other systems, e.g. Technigaz, there will be differences in membrane construction and insulation structure. A thin flexible membrane, called the primary membrane, which is in contact with the cargo. This is fabricated from Invar and has a typical thickness of 0.7mm. A layer of plywood boxes filled with Perlite, called the primary insulation, typically of approximately 230 mm thickness. A second flexible membrane similar to the first one, called the secondary membrane. Also of Invar and having a typical thickness of 0.7mm. A second layer of boxes, also filled with Perlite, and in contact with the inner hull, called the secondary insulation. This layer is typically of approximately 300 mm thickness. The tank lining thus consists of two identical layers of membrane and insulation, so that in the event of a leak in the primary barrier, the cargo will be contained by the secondary barrier. The secondary barrier is only designed to contain any envisaged leakage of cargo for a period of 15 days. ( IGC Chapter 1V 4.7.4). This system ensures that all the hydrostatic loads of the cargo are transmitted through the membranes and insulation to the inner hull plating of the ship. The function of the membranes is to prevent leakage, while the insulation supports and transmits the loads and, in addition, minimises heat exchange between the cargo and the inner hull. The secondary membrane, sandwiched between the two layers of insulation, not only provides a safety barrier between the two layers of insulation, but also reduces convection currents within the insulation. The heat flow into the tank is limited to such an extent that the evaporation, or boil-off rate, is about 0.15% per day based on sea surface temperature of 32 degrees and air temperature 45 degrees Celsius. The inner hull steel does not attain a temperature below its minimum design value, even in the case of failure of the primary barrier. Any deflections resulting from applied strains and stresses are acceptable by the primary barrier. In addition to the above, the insulation acts as a barrier to prevent any contact between ballast water and the primary barrier, in the event of leakage through the inner hull. The insulation system is designed to maintain the boil-off losses from the cargo at an acceptable level, and to protect the inner hull steel from the effect of excessively low temperature. If the insulation efficiency should deteriorate for any reason, the effect may be a lowering of the inner hull steel temperature, i.e. a cold spot and an increase in boil-off from the affected tank. If necessary, increased boil-off gas may be vented to the atmosphere via the vent riser and gas heater. The inner hull steel temperature must, however, be maintained within acceptable limits to prevent possible brittle fracture. Thermocouples are normally distributed over the surface of the inner hull, but unless a cold spot occurs immediately adjacent to a sensor, these can only serve as a general indication of steel temperature. To date, the only reliable way of detecting cold spots is by frequent visual inspections of the ballast spaces on the loaded voyage. In addition to failure of the membrane, local cold spots can occur due to failure of the insulation. While the inner hull steel quality has been chosen to withstand the minimum temperature likely to occur in service, prolonged operation at steel temperatures below 0°C will cause ice build-up on the plating, which in turn will cause a further lowering of steel temperature due to the insulating effect of the ice. To avoid this, heating coils may be fitted in the cofferdam spaces, of sufficient capacity to maintain the inner hull steel temperature at 0°C under the worst conditions. If a cold spot is detected, either by the inner hull temperature measurement system, or by visual inspection, the extent and location of the ice formation should be recorded. Small local cold spots are not critical and, provided a close watch and record are kept as a check against further deterioration and spreading of the ice formation, no further action is required. If the cold spot is extensive, or tending to spread rapidly, salt water spraying should be carried out. In the unlikely event that this remedy is insufficient and it is considered unsafe to delay discharge of cargo until arrival at the discharge port, the final recourse will be to jettison the cargo via a spool piece fitted at the cargo liquid manifold, using a single main cargo pump. This action should only be taken after full consultation with the Managing Office and relevant authorities. It is a requirement that all spaces around the cargo tanks are inspected at least once in every six month period. To meet this requirement the inner hull around a nominated cargo tank is inspected from the ballast tank, cofferdam, and whaleback areas (including the whaleback areas external to the ballast tank), each alternate passage. This frequency ensures every space is inspected within the required period. These inspections should commence approximately 48 hours after a cargo is loaded. The following points are to be covered and recorded. The position and temperature of cold spots or absence of cold spots. Condition of paintwork - a reference sheet is provided for this. Extent of corrosion on both the inner and outer hulls, particularly under the suction strums, in the way of striking plates and behind heating coils in the ballast and cofferdams. Position and amount of sediment. Any damage, fractures etc. Particular attention to be paid to the external portion of the inner hull for evidence of fractures, and to the turn of the bilge areas of the inner hull within the midships section of the vessel. Hydraulic or heating coil leaks and the condition of scupper pipes. The duct keel is to be inspected every six months and must be well ventilated by fan before entry. All spaces should be inspected on the first cargo after a drydock period. The void space around each of the liquid domes should be included in the inspection of the spaces around the nominated cargo tank. NOTE: It is a Classification requirement for the granting of a valid Certificate of Fitness for ships carrying liquefied gases in bulk that routine cold spot inspections are carried and recorded.